Spaces for Change has just submitted an FOI request to the Petroleum Products Pricing Regulatory Agency (PPPRA), requesting for the status of over-recovery earnings on premium motor spirit (PMS) and household kerosene (HHK). 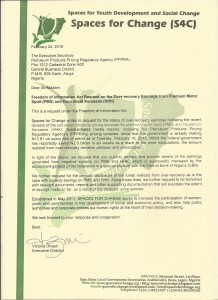 Substantiated media reports, including the Petroleum Products Pricing Regulatory Agency’s (PPPRA’s) pricing template, show that following the recent revision of the petroleum products pricing template, the Nigerian government is already making N13.81 on every litre of petrol as at Tuesday, February 16, 2016. While the federal government has reportedly saved N2.6 billion in six weeks as a result of the price modulations, the amount realized from over-recovery remains unknown and undisclosed. In light of the above, we request that you provide details of the earnings generated from negative subsidy on PMS and HHK, which is supposedly managed by the accountant-general of the federation in a special account with the Central Bank of Nigeria (CBN). We further request for the periodic disclosure of the funds realized from over-recovery as is the case with subsidy savings on PMS and HHK. Along these lines, we further request to be furnished with relevant documents, reports and other supporting documentation that will elucidate the extent of savings made so far, as a result of the products’ price reviews. Established in May 2011, SPACES FOR CHANGE works to increase the participation of women, youth and communities in the development of social and economic policy, and also help public authorities and corporate entities put human rights at the heart of their decision-making.